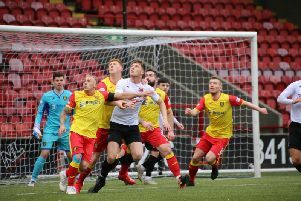 Berwick failed to put any more daylight between themselves and fellow League 2 strugglers Albion Rovers when Queen’s Park came from behind to win at a wet and windy Shielfield on Tuesday. Cameron Blues gave Rangers a first-half lead but Kieran Moore equalised before the break and Lewis Hawke netted in the second half, as the visitors came back to claim all three points. The defeat means Rangers have now failed to win any of their last 15 games and they remain just two points ahead in the basement stakes. Berwick manager Johnny Harvey said: “It was another disappointing result for us but I can assure everyone that we are all working hard to try and turn things around. Queen’s had beaten Rangers 7-1 at Hampden back in January but, when Blues headed Berwick in front on 18 minutes, after a good run down the right and cross from Calum Adamson, there were hopes they might avenge that result. Calvin McGrory then had a shot blocked for Queen’s in the box, while Daryl Healy shot into the side netting for Berwick on a quick break. Queen’s were restricted to shots from the edge of the box in the first half but equalised on 35 minutes, when Moore fired a low shot home after the ball was cut back from the right by Scott McLean. Early in the second half, Hawke headed over for Queen’s from six yards out but, on 61 minutes, the striker headed Queen’s 2-1 in front from a corner. On 76 minutes, Berwick’s Lewis Barr struck a post from a tight angle but, in the worsening conditions, both sides struggled to contend with the elements. In the closing stages, only a rising shot from the visitors’ David Galt threatened either goal. Things don’t get any easier for Berwick this weekend when they host high-flying Peterhead.